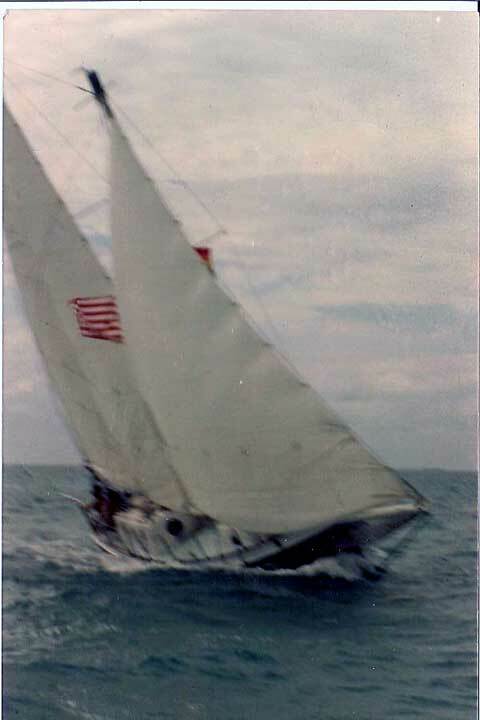 Here is the history of the Duga as best I remember from Dusty who owned her and a few stories other old pirates in Islamorada told me. 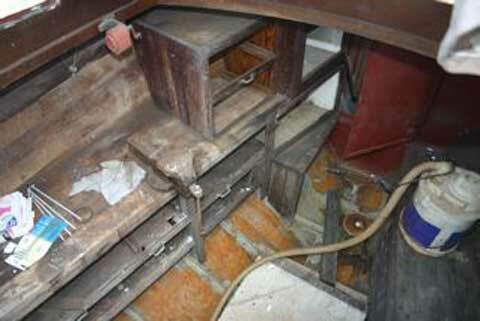 The hull was built in Germany in 1885. It is riveted ?quarter inch? black iron with lots of patches that add character. She was originally a river tugboat, one of the reasons she only draws 3.5 to 4 feet of water. During the war ? WW1 ? she was moved to Sweden to avoid having her melted down for ammunition. 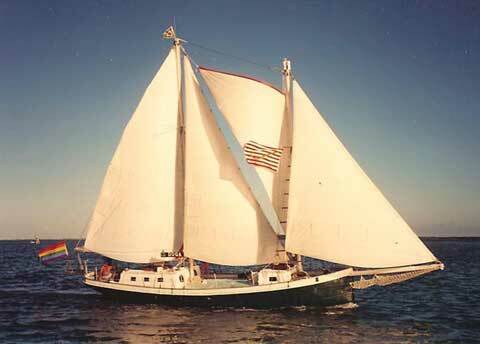 Sven Lunden-Yrvind found her on a canal in Sweden in 1968 and turned her into a staysail schooner. He rigged her to be sailed by one man, apparently his specialty. His last voyage ended in Florida in 1971 where Dusty met him and bought the Duga. Dusty sailed her up and down the Americas and many trips to his beloved Bahamas. Dusty lived on her with home base being Islamorada, Florida until he passed away June, 2002. 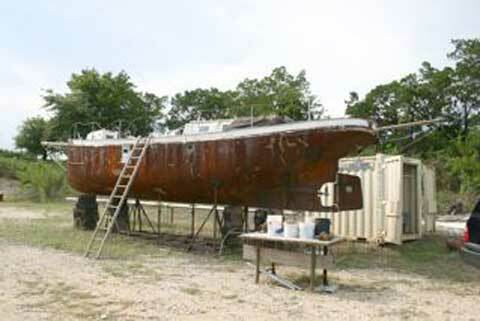 We moved her to a marina in Austin, Texas and started restoration. She has had quite a bit of scaling and welding already. She does have a small Volvo Penta (1 cyl. I think) engine. The engine was pulled and serviced last year. She measures 40 foot (not counting a boom on the front) with a 10 foot beam and weighs about 12 tons. She was derigged (saved and labeled) by professionals in Islamorada. The sails are in very good shape and are dry and stored. When we brought her to Austin, we did a hard sandblasting. We had a retired marine surveyor give us some guidance. I then had a welder working on and off for me for a little more than a year. He replaced and patched probably 50 square feet of iron where it was thin. There are probably 5 or 6 more small spots to work on including rebuilding (or patching) a porthole Dusty had put in to "watch the fish". Actually, I think he used it to check out dive spots he was interested in. The center board is out. The housing for it is in good shape, we cut a couple of places out so we had access to clean and paint before we put the center board back in. It needs new bumpers. The cemter board is massive. Probably weighs a ton or so. By the way, the boat weighed, according to the crane operator, about 12 tons. We are not boating people, so I apologize if my terminology is off. We figured she needed about a good weeks work to finish up the welding (just a WAG) so we could paint. 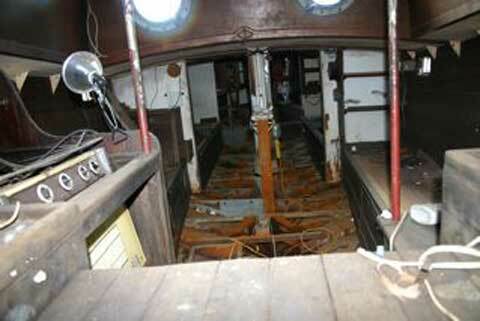 She is stripped down, so the ballast would have to be reinstalled. Water tanks need to be re-installed. The engine and fuel tanks are okay. We had the motor taken out, serviced and reinstalled. We painted the engine compartment. The little penta ran great. She was "de-rigged" by a professional in Islamorada. He labeled everything and said it should be pretty easy for someone who knows how to rig it back up. A cute story - My wife contracted them over the phone. They gave us an estimate. When we got there our Islamorada Marina lady made the comment they had been working on her "an awful lot" and had people coming and going all the time. When they were finished and it was time to settle, the owner of the company called me to the side. I expected the usual - it took longer than we thought- deal. He said they had learned so much from the way she was rigged (for one man operation in the open seas) and he was able to train some of his other de-riggers, he was knocking 10% of the quote he had given me. That's just the opposite of what normally happens in the Keys! 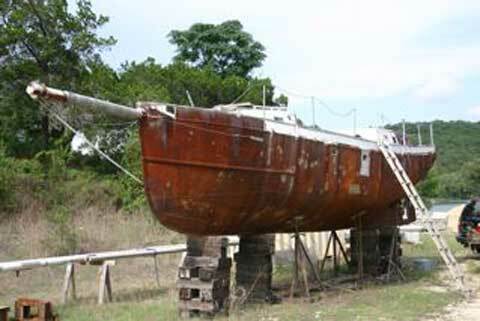 We sold the boat to someone who has "restoration" experience and plans to keep her on the Texas coast. Thank you for helping us find her a proper home.